The title of all Izumi Kato’s works is “Untitled”. By this means, no false association can be triggered by the title. In the case of Kato, the paintings are without a title in order to leave all interpretation to the viewers. It is as if the painter presents them with a white canvas. He nevertheless does leave his traces on the canvas. 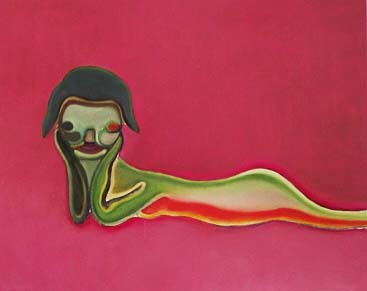 From 1998 to 1999, when he decided to become a painter, he painted a form that looked like a larva or embryo. After the portrait series “Good Face” in 1999, he in 2000 then produced paintings on which a man or a woman is recognizable. Since 2003 he has drawn forms that look like little children. Now he depicts human forms that go beyond the conventional framework. Looking at the paintings, Kubota felt their shaman-like vital energy and responded with awe and respect. The way Kato’s career has developed is certainly exceptional, because up to then he had had only very few exhibitions. The art scene’s critics and curators recognized the artist’s strong inherent potential and expressed this in words. But they could not explain why Kato painted “the human form” or something similar. Here is where the comments by Tamaki Saito, a psychoanalyst who was very profoundly impressed by Kato’s works, could prove interesting. They were made during an interview with the artist on the occasion of his 2003 exhibition at the Fuchu Art Museum, in which the artists showed childlike forms. In his analysis, Saito compared Kato to Francis Bacon and pointed out what the two had in common. The human form that excites the viewers’ attention should not produce a story in order to achieve ‘the right picture’. Izumi Kato, the artist, does not dare present a white canvas. He adds something to the canvas. The work has no title. But in my opinion, the owner of the painting must in future invent the invisible “story” in order to come closer to the ”quintessence”.